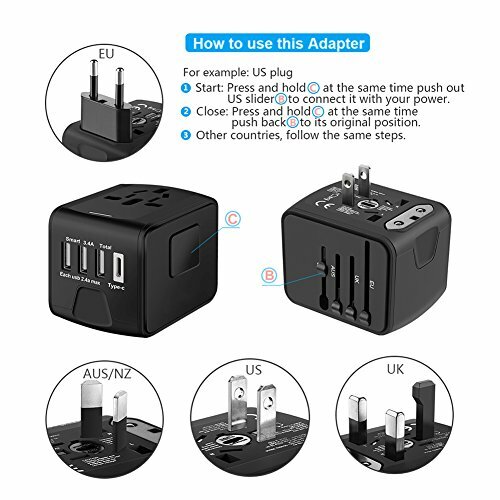 Universal International Travel Power Adapter W/High Speed 2.4A USB, 3.0A Type-C Wall Charger, European Adapter, Worldwide AC Outlet Plugs Adapters for Europe, UK, US, AU, Asia-Black[International Compatibility]: 5 in 1 International Power Adapter, 1 USB-C port and 3xUSB ports and 1 Universal AC Socket, enough to simultaneously charge 5 devices. 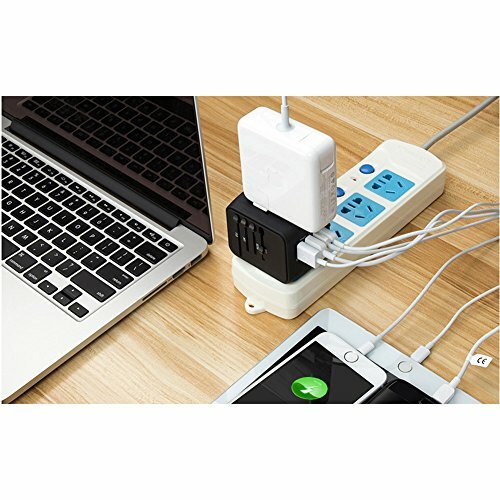 Perfect Power Charging Solution for your worldwide traveling. 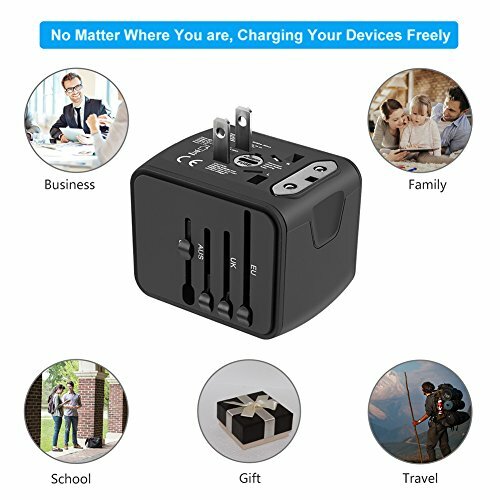 It Covers over 150 countries like USA,Canada,Mexico,Germany,Japan, China,Korea,India,Italy,Brazil,Europe, Asia, the Middle East,Etc. 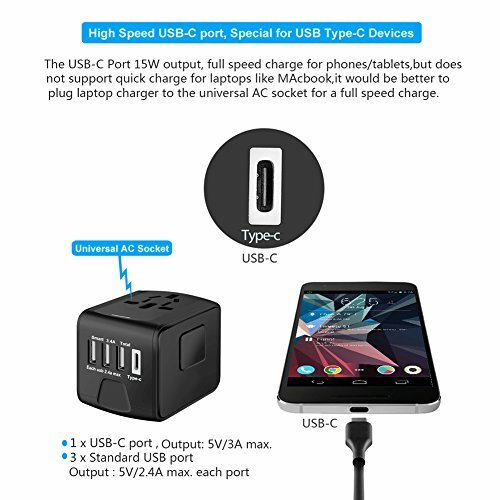 [High speed USB-C]: USB-C port 3A/5V output, enable double speed charging phones, tablets at a full 3-amp rate, USB-C port compatible for latest generation USB-C powered phones/tablets like Google Nexus 5X/6P/LG G6/HTC 10/Samsung Galaxy S8/Note 8/Nokia N1/Galaxy Tab Series tablets,and more. 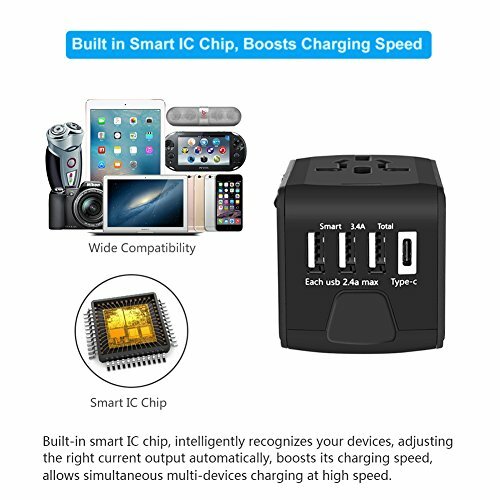 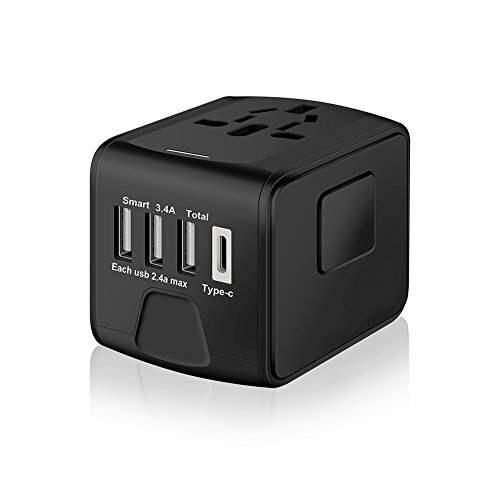 [Built-in Smart IC Chip]: SAUNORCH Universal Travel Adapter built in Smart IC Chip, intelligently recognizes your devices, adjusting the right current output automatically, boosts its charging speed, allow simultaneous charging your devices at high speed. 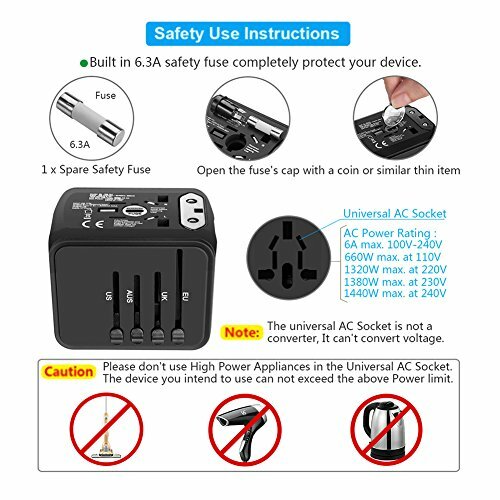 [Worry Free Guarantee]:Full Lifetime Warranty, if product not work, you can ask for a replacement or money back, we offer full 24/7 courteous friendly customer service for all of your needs.Please feel free to contact us.